I successfully made bagels. This was right on the heels of making nanaimo bars for the first time yesterday and having those be a smashing success as well. I did a little dance after every step worked out - starting with making the dough, then kneading it, then letting it rise, then boiling them, then baking them! I'm so pleased with my work. After talking for weeks about making bagels, today was the day and they. are. delicious. These are 'skinny' as my sister keeps reminding me, but for my first time, taste-wise, I think they turned out great. They may be troublesome when it comes to cutting them in half, but we'll have to see if there are even any left! We keep eating them as-is right out of the bag. They are that good. They have 1/4 cup of honey in the dough mixture, and they're boiled in honey so they have a sweeter taste to them. But I can't stop exclaiming how delicious these bagels are. If you've ever wanted to try your hand at them, I'd be the first to encourage you, and likely the first person at your door to enjoy them warm out of the oven. And the most important part of the post! Here's the recipe adapted from bleubirdblog! + note that you could use onion powder, etc. and make any everything bagel, which I only thought of mid-boil and realized I didn't have any onion or garlic powder. In a bowl, stir together yeast and warm water. Cover with a tea towel and let stand for 5 minutes (until bubbly). Add salt, sugar, oil, honey and egg into yeast mixture and whisk together. Add one cup of flour and stir until dough starts to form. Add remaining three cups of flour and mix until incorporated. The dough will look a little rough but that's where the kneading comes in! Once the dough is mixed, place on a floured surface and knead for 8-10 minutes, adding flour as needed. The dough should be smooth after the kneading. Place an inverted bowl over top of the ball of dough and let it rise for 30 minutes. Take the risen dough (it will have roughly doubled in size) and divide it into 18 equal portions*. Roll until they are 20cm (8 inches) in length, then pinch the ends together so they don't separate in the boiling process. Place the bagels on a baking sheet lined with parchment paper and cover with a clean tea towel - let them rise for 20 minutes. As the bagels are in the last few minutes of rising, bring 16 cups of water to boil in a large stockpot. Once the water is boiling add the honey and baking soda and turn down to a rolling simmer. Add the bagels two at a time and allow them to boil for one minute per side. After you remove them from the water, place in the seeds (if desired) and then back on a baking sheet. Bake in the oven at 500*F for 8-10 minutes (depends on thickness of the bagel) until the bottoms are golden brown. 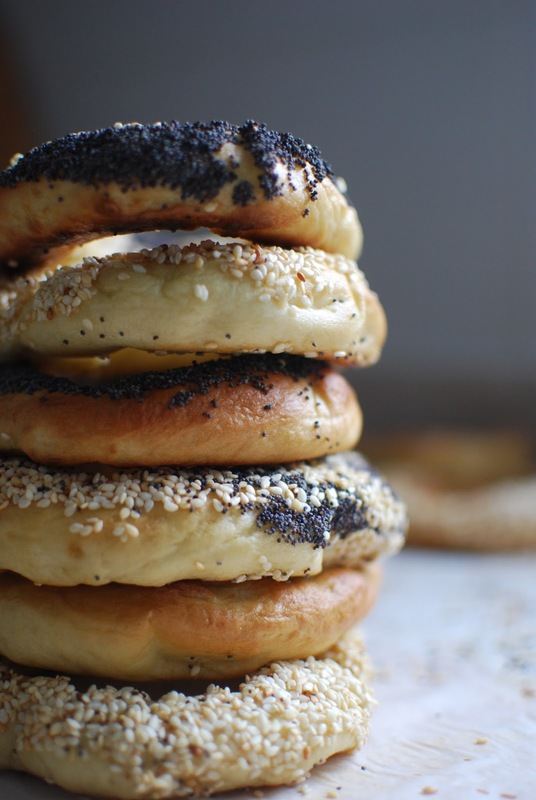 Flip bagels over and bake for another 5 minutes until they are golden all over. *this is where I struggled and I think that's why some of them are so skinny with such large holes in the centre. I would recommend really making sure that all the portions are equal so that the size and thickness of the bagel is consistent. Remove them from the oven and see if you can wait for them to cool before enjoying them! In between starting this post and finishing this post, we toasted one up, put herb and garlic cream cheese and smoked salmon on top and ate every single bite! So there you have it - homemade bagels, Kettleman's inspired. I'd recommend trying it out! They are time consuming given you have to wait for the dough to rise a few times, but doing laundry in between and consistently sweeping seeds of the floor helps pass the time. Let me know if you give these a try, and until next time - happy making!